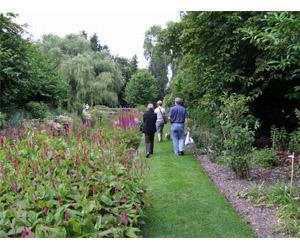 Educational Visits at Gooderstone Water Gardens01603 712913work Educational VisitsNorfolk's pleasure garden. Six beautiful acres with four ponds, waterways, trout stream, 14 bridges, mature trees and shrubs. A garden developed for the enjoyment of visitors and enhancement of wildlife. By providing nest boxes, leaving log piles, growing native shrubs and plants, and not being over-tidy - the garden's natural potential is actively encouraged. The eight acre fen area is sympathetically managed to encourage its natural flora, whilst the bird hide provides regular kingfisher sightings. Many plants are labelled. OPENING TIMES: Garden open all year, daily 1000-1730 (or dusk). Tearoom open 2 April to 30 May, weekends and Bank Holidays. Daily from the 31 May (except Mondays). Closed 29 May, 24 to 26 June. SUGGESTED LENGTH OF VISIT: 2 to 3 hours. Norfolk's pleasure garden. Six beautiful acres with four ponds, waterways, trout stream, 14 bridges, mature trees and shrubs. A garden developed for the enjoyment of visitors and enhancement of wildlife. By providing nest boxes, leaving log piles, growing native shrubs and plants, and not being over-tidy - the garden's natural potential is actively encouraged. The eight acre fen area is sympathetically managed to encourage its natural flora, whilst the bird hide provides regular kingfisher sightings. Many plants are labelled. Free preliminary visit for teacher, classroom/study area (Mondays only), welcome talk and demonstrations available, guided tours, indoor eating area available, outdoor eating area available, languages spoken (basic German). Take either A1065 or A47 to Swaffham, from Swaffham take Cley Road. Drive through Cockley Cley. Continue 1.5 miles to 1st left turn to Gooderstone and signposted water garden.